Imagico photo log - Essays - Who is the artist? a lot has been written on the change of art in general and photography in particular during what is commonly called the digital revolution. I don't intend to engage in yet another speculation on how the future of photographic art in the digital world might look like. Instead i would like to describe a problem that is quite frequently and unavoidably involved with the use of digital instruments in works of art but that is none the less rarely seen. Shown above is an image by Caspar David Friedrich - a German Painter from the 18th to 19th century known primarily for his romantic landscape paintings. I have written it is an image by C.D.F. and no one would probably seriously doubt this. 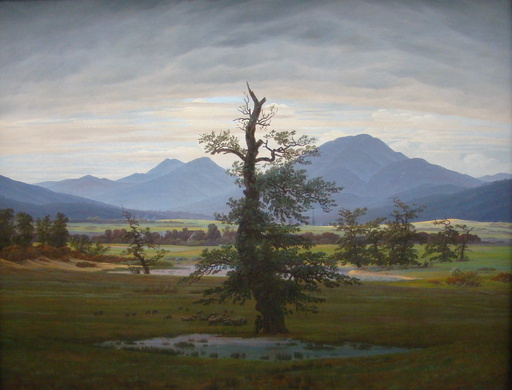 Even if there was no historic record attributing this particular image (named Der einsame Baum - the lonesome tree) to him the style of the painting strongly indicates that this work stems from the hand of Caspar David Friedrich. 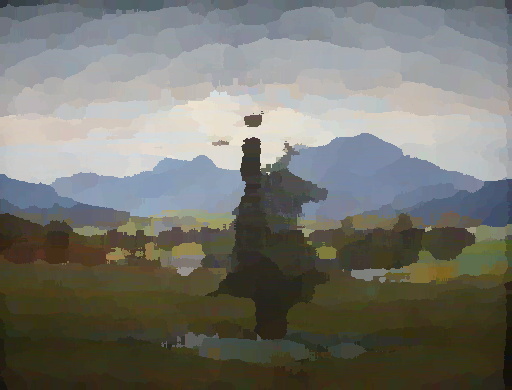 In fact the digital image you can see above is of course not Friedrich's painting itself but a photographic reproduction (scaled down from the version on Wikipedia which is in the public domain. Most are well aware of #5 and most photographer acknowledge the importance of the equipment for making photograph. But let us keep in mind the question was about the artist. The artist is the one who expresses himself, his ideas and his emotions, in the piece of art he creates. The key aspect of the artist's work is creativity. Without creativity the result is maybe a piece of craft but not a work of art. Based on this let us have a closer look at the list above and see whose work we can consider an artistic contribution. If we take #4: The creation of a sophisticated pigment for painting might indeed be an act of creativity even if in most cases it will be understood as a craft. But does this make the paintmaker's work an artistic contribution in Friedrich's painting? I would say no since it is Caspar David Friedrich who has chosen his paints. Even if the painting required a very special pigment only available from a single gifted paintmaker without who's work the painting could not have been created as we know it this merely limits Friedrich's ability to express himself but does not constitute an artistic component of the image itself. This general concept – i would call it the tools concept is quite commonly used when people talk about art and creativity, especially in case of photography. The artist is using various tools to create his work but the tools themselves, even if they are pieces of art on their own, are usually considered merely technical but not artistic contributions. On the other hand if we take the photographic reproduction of a painting without any artistic intent on its own - this is commonly considered a merely technical work, even if it requires significant skills from the photographer. So getting back to the above example – if we consider my manipulation of Friedrich's painting a piece of art, according to the tools concept i would be considered the artist. At the same time #2 and consequently #5 are definitely ruled out as artistic contributions. For those readers who are not used to non-interactive programs - loading an image into Photoshop and applying any kind of filter would essentially be quite the same for the sake of this argument. What we see is that my work in applying this manipulation is rather trivial in contrast to the work of the programmer who implemented this filter. Still – like in case of the paintmaker – the programmer can hardly be considered an artistic contributor here (so we rule out #6 in the above list as well). Although he probably tested his implementation on some images he almost certainly did not do so on this particular one. There is a certain aspect about digital tools that makes them different from the physical ones though. That is the way complexity can be hidden. A painter – even if he has access to paints from an exceptional paint maker – will have to master the techniques of painting to a high degree to be able to articulate his ideas and emotions in a painting. For an artist using digital tools this appears to be the case only to a much lesser degree. A large percentage of digital artists do not even know how an image is represented inside a computer and even more of them do not know the inner workings of the filters they apply to their images. So even if we do not consider the work of the programmer an artistic contribution we have to accept that due to the complex inner workings of digital tools which are mostly hidden from the user leaving him no way to influence them, the programmer has a tremendous influence on the work of artists using his tools. In my opinion this means that many apparent advantages of digital techniques in art production come at a high price. I might think that i can express my creativity in the above image by choosing from the limited set of filters and their parameters in the imaging program of my choice. And of course most readers will agree that taking a course in use of the imaging program or reading a book about it will improve my ability to use it. But wouldn't the ability to actually change the inner working of the program, the ability to freely change the way this filter works, improve my ability to artistically express myself even further? I do not want to urge all artists using digital tools to start programming everything they use themselves from ground up. This would be pointless and would actually limit your artistic possibilities. But the essence of this essay is meant to be: You should not accept a higher degree of hidden complexity in your digital tools than you do in case of conventional art technique. Otherwise you end up being limited in your artistic expression by the people developing those tools and no course or book will be able to prevent that.